The Phantom of the Opera (1925) is a silent horror movie. It is based on a novel of the same name by Gaston Leroux. The movie was directed by Rupert Julian. 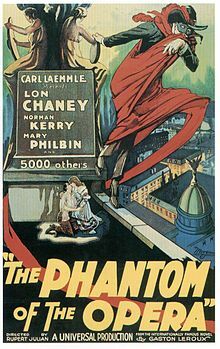 It stars Lon Chaney as the Phantom and Mary Philbin as his love, Christine. The movie is famous for Chaney's horrific, self-applied make-up. The story is about a disfigured man named Erik who haunts the Paris Opera. He wants the managers to make the woman he loves, named Christine, a star. In order to do this, he terrorizes everyone by doing things such as dropping a chandelier and wearing a scary disguise in the middle of a large party. When he learns that Christine is in love with a man named Raoul, he kidnaps her. Raoul eventually rescues her, and a group of angry people chase the Phantom until he falls into the Seine river. The movie was a great success. The critics liked it. Executives at Universal Pictures were pleased. They put a string of horror movies into production. These movies included Bela Lugosi's Dracula and Boris Karloff's Frankenstein. Phantom was chosen for preservation in the United States National Film Registry. Two major versions of the film survive today. The original film (today) comes from bad quality "show at home" film prints which are entirely black and white. The more common version is a 1929 silent version using different takes and camera angles. The 1929 silent version exists because of a lost 1929 sound version in which new scenes were shot in sound.